At last, the quest to recreate the classic single‑coil tone — but without the noise — appears to be over. Creating a guitar pickup with the sound of a traditional single‑coil pickup but without the associated problems of noise may have taken a long time, but Chris Kinman has finally cracked it. His original noise‑cancelling pickups were launched about 12 years ago, and at that time represented the culmination of 16 years' research and development. Kinman's patented differential winding technology (which Chris tells me has been 'borrowed without permission' by one or two other manufacturers) got much closer to the sound of a traditional single‑coil pickup. 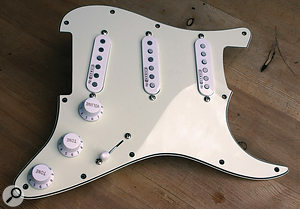 They still lacked the high‑frequency detail of a brand new, non‑noiseless Strat pickup, but many guitar players liked the slightly aged sound, and on some instruments that just happen to have a very bright tone, they can save the guitar from sounding too thin. Kinman's Traditional Mk III design produced a slightly less aged sound than previous models, but still didn't deliver the zingy high end of a brand-new single‑coil pickup. Being obsessed with guitar tone to the extent that only a player and guitar builder can be, Chris went back to basics and looked for a new approach after he was asked by guitarist Hank Marvin to design a pickup that faithfully replicated his '60s Shadows sound. Chris aimed to recreate the sound of a Fender CS54 Strat pickup, but without any of the ageing effects of the Mk III. Unfortunately, this kind of development work can often take years, so he wasn't able to meet the deadline for the Shadows tour, but with untold hours of burning the midnight oil, Chris got the results he wanted — in the form of the Impersonator 54 — in just 18 months, which is remarkable. Kinman started out without the steel shield around the upper coil (so this aspect of the pickup is true, old‑school single‑coil design), though the six rod magnets are Kinman's unique proprietary, low‑strength, Alnico‑5 that reduce string pull by some 40 percent. More magic comes with the hum‑sensing coil that's mounted below the main coil, because the challenge here is to pick up the same amount of hum as in the pickup's main coil, while using far fewer turns of wire. That way, the hum‑cancelling coil doesn't affect the tonality of the pickup by raising its capacitance or inductance. In the earlier Kinman designs, the hum‑sensing coil was wound on a plastic bobbin with 10 steel‑core pins, but this wasn't nearly efficient enough for the design that Chris envisioned, so he was forced to rethink the design of the hum sensor. He tried a novel approach to achieving greater efficiency, using a laminated, 100 percent steel, H‑core bobbin for the hum‑sensing coil. His H‑core is laminated from 150 individual H‑shaped steel plates bonded together with two steel-end caps to form a bobbin, and it thus employs a greater mass of steel than in his previous plastic‑bobbin designs. This in turn enabled him to achieve the required degree of hum cancellation with fewer turns of wire. Including the laminations, the Impersonator 54 has 160 individual parts, compared with just 27 for the Traditional Mk III, yet it costs only slightly more. Kinman's solderless wiring harness is designed to make installation of the pickups hassle-free. I had a nice‑but‑noisy Strat‑style guitar built from a Mighty Mite neck and a Fiesta Red Allparts body that I originally fitted with vintage‑style, single‑coil pickups. Switching to the Impersonator 54 set was easy, as Chris supplied a K7 no‑solder harness with the review samples, so within the hour I was plugged in and playing without ever touching my soldering iron. Getting the pickup‑to‑string spacing is important with stacked humbucker designs such as these, as it seems to affect the tonality more than with single‑coils. This isn't a problem, but it's a good idea to follow the manufacturer's recommendations when it comes to adjusting your new pickups. As Kinman uses a lower‑strength magnet, you can set the pickups very close to the strings without the atonal warbling that occurs when doing the same with conventional pickups. The Impersonator 54s get full marks for hum‑cancelling performance, and other than the lack of noise, I could hear no significant difference between original single‑coils and the Impersonator 54s: the high frequencies were just as airy and jangly. I have a recent US Strat Deluxe fitted with Fender's own noiseless pickups, and while it is a good‑sounding instrument, it doesn't have anything like the same open top end or mid-range transparency that the Kinman‑equipped guitar has. Not only do they sound like single‑coil pickups, but, importantly, they also feel the same when playing — by which I mean that the dynamic response is comparable. The increased frequency response and mid‑range transparency also means that those 'in‑between' sounds at selector positions two and four are extremely authentic, with just the right amount of phasey 'quack'. Chris Kinman's Impersonator 54 pickups represent the final leap forward in duplicating the sound of a true single‑coil pickup in a stacked‑humbucker design. You'll certainly need ears more golden than mine to hear any difference! Whether you prefer the slightly aged Traditional Mk III sound or that of the more detailed, 'new' Impersonator 54 is a matter of taste, and your choice may be influenced by the acoustic properties of the instrument to which they'll be fitted. Whichever you prefer, you now have the option to switch to low‑noise, studio‑friendly pickups that won't compromise your tone. When creating the Impersonator 54, Chris Kinman discovered that the tonal changes in old Strat pickups are due to changes in the insulating coating on the wire, not to any ageing of the magnets themselves. He proved this by rewinding a very old Strat pickup, using the type of wire used when it was manufactured in the early '60s. Before rewinding, the aged coil had a reduced resonant peak and depressed inductance, which translated to softer attack, lower dynamic range, dull high end and low output level. The rewound pickup had all the snap, shimmer and bell‑like tones of a brand new one. These pickups really nail the tone of a new single-coil pickup. Easy to fit using optional harness if you hate soldering! Harness only available directly from Kinman in Australia. These are the first stacked humbuckers I've heard that really nail the sound of a non‑aged single‑coil pickup. Impersonator 54 three‑pickup set £249; Traditional Mk III three‑pickup set £229. Prices include VAT. K7 no‑soldering harness £69 (direct from Kinman, excludes tax and shipping). Musictrack +44 (0) 1767 313447. Impersonator 54 three‑pickup set $310; K7 no‑soldering harness $112. Prices exclude shipping.